Beautiful, right? This is the hardcover edition. I recently discovered that the paperback got a cover makeover, and at first I was against it, but the more I study this new cover, the more I like it. 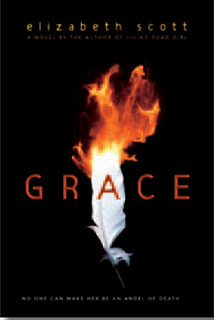 The flames that I liked so well are still present, and the image of them consuming the feather is so, so symbolic and fits with what happens in the story. I like the simple black background and the orange font. The simplicity of this cover is just beautiful. 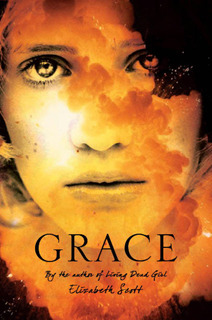 I like the paperback version of GRACE. It's simple, yet seems to tell a story itself with that feather. I like both, but I think the paperback version is my favorite. There's just something that's very striking about it. I still like both covers! Though I admit that I've never really gotten into Elizabeth Scott's books, though I love their covers. I like the paperback cover much better. The meaning of the paperback cover isn't immediately clear... I couldn't figure what the white and orange think was for a moment. But, I think it holds a deeper symbol/meaning once I realized what it's supposed to mean. i prefer the old cover! a while ago i saw it on the web some blog and i immediatley wanted to know more and i thought it was just so gorgeous and different! now im kicking myself over not buying it because normally i prefer paperbacks. I think the new paperback version looks a bit older. I haven't read this one yet, so I don't know if the cover is a better representation of the book. I love the first cover with her face. You can see the desperation in her eyes. And what a terrifying topic, considering current events. I like both. I think the paperback verison is a good version for paperback.